The idea of throwing one’s fridge and pantry contents onto a baking pan, roasting it, and calling it dinner isn’t new. I’ve seen variations of this recipe all over Pinterest, often going by the name “Lazy Day Casserole,” or something to that effect. Love the idea! The version on which I ultimately based my dinner was a recipe from the Hillshire Farm website! 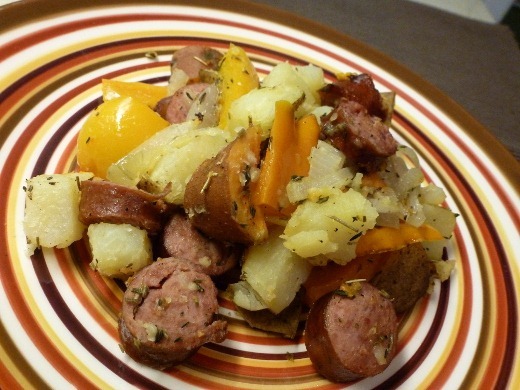 Smoked Turkey Sausage is one of my favorite ingredients with which to cook, and I’ve found that the company has a few fun and different ideas for cooking with their products on their website. I changed a few things up in Hillshire Farm’s recipe, but that is the beauty of this concept – the variations are endless – add or omit any veggies you would like. 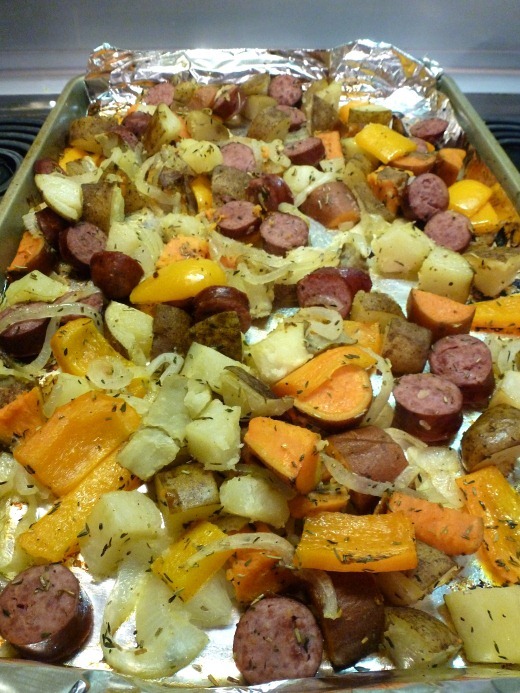 My version used Smoked Turkey Sausage, par-boiled potatoes and sweet potatoes, onions, and yellow bell pepper. Broccoli, cauliflower, banana peppers, carrots, or fennel would all be great additions. All of the meat and veggie ingredients were tossed with garlic, chicken broth, olive oil, and seasonings, and then roasted on a cookie sheet for about 40 minutes. Can’t get much easier! The sweet potatoes were actually my favorite part. I’m really starting to prefer savory sweet potatoes over sweetened ones, or even over plain. But… the huz prefers them to be sweet and isn’t a huge fan of savory sweet potatoes, so it’s always a toss-up deciding what to do when I prepare them. Preheat oven to 400° F. Cut sausage in 1/4” slices; set aside. 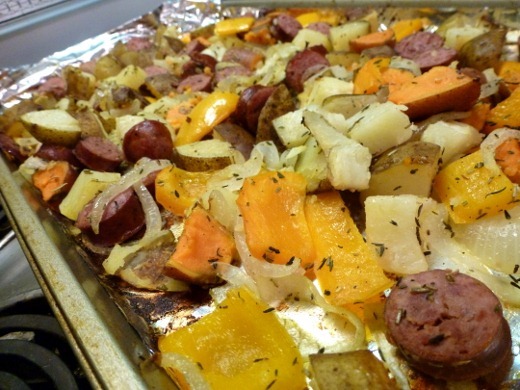 Combine sausage, potatoes, bell peppers, onion, garlic, chicken broth, olive oil and seasonings in baking dish; mix lightly. 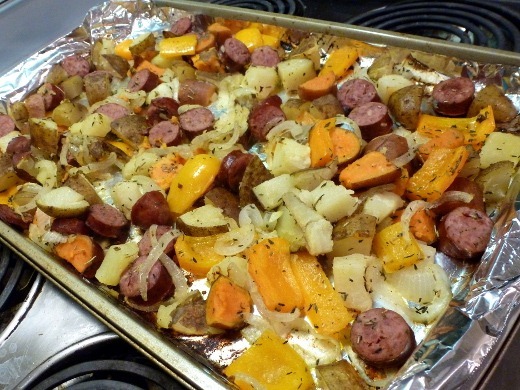 Bake for 30 minutes or until potatoes are lightly browned and vegetables are tender. For crispier potatoes, bake 10-15 minutes longer. (I baked for about 40 minutes). The easiness factor boosted the score a bit!